Easter is on its way and what better basket stuffer can you get than this colorful Easter Egg Plushie. My 4 year old loved these little soft Easter eggs and quickly turned them into “dinosaur eggs” and “pokemon eggs” for his stuffed animal. Make them in your little one’s favorite color and they are sure to be a hit. The soft squishiness of the blanket yarn makes this one a keeper. No Easter baskets to fill? 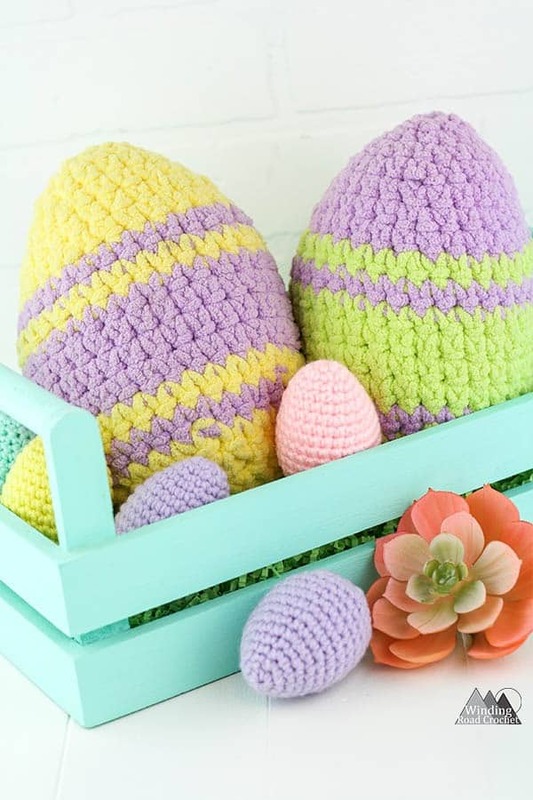 Crochet these up and toss them on your couch for a nice Easter decoration. These eggs are a great way to use up left over yarn from other Bernat Blanket yarn projects. This is such a soft yarn that makes these eggs so soft and very quick to work up. These eggs take a very small amount of yarn and work up in less than 30 minutes. They will also compliment my Crochet Easter Egg and Carrots pattern that can be found here. Need more patterns added to your crochet list? Check out all my Free Crochet Patterns. Plus here are some of my favorites. Stuff your egg with polyfil. R19: Sc2Tog 6 times. Finish off here and weave your end through the last 6 stitches, pull tight and tie off. Weave in all ends. Now you can throw this little egg on a chair or couch to brighten up a room or hide it away to put into someone’s Easter basket! Let me know how you like this pattern and if there is anything I can do to improve my pattern writing. If you have any questions leave a comment below and I will try and help the best I can. Share a photo of your Easter Egg Plushie, I would LOVE to see a photo! If you share it on social media be sure to tag me @windingroadcrochet or #windingroadcrochet. Written pattern, tutorials, graphs and pdfs of the Easter Egg Plushie are copyright Windingroadcrochet.com. Please do not reprint or repost this content as your own, but please feel free to share this link with others. You can find more information on sharing my work with others in the Terms and Conditions Page.